This venting model consists of a durable, weather resistant, extruded aluminum retaining frame and an extruded two piece fusion welded vinyl (PVC) sash and base frame. The vinyl base frame is thermally broken and features a double wall frame construction that forms an annular dead air space for optimal insulation. The OVSF includes built in vinyl curb and wide flashing flange for optimum seal. 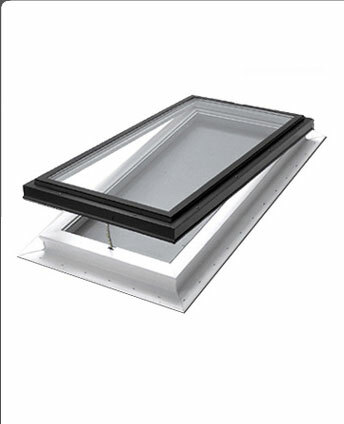 The easiest venting skylight model to install. The Columbia vinyl self flashing models must be installed on minimum 3:12 roof pitch. The handle may be replaced with adaptor to use in conjunction with telescoping extension poles. Available in 4-6’ and 6-10’ lengths. See Accessories section for additional information. All above standard tempered / tempered sealed units. Each option available with interior pane in laminated — clear or white. Any other glass options, including grey, blue, green etc in plain or coated glass is available. All above available in single, double, or triple glazed. See Glazing section for additional information. See Why Skylights – What Size section for additional information. Acrylic and polycarbonate available in 22 standard sizes from 16” x 16” to 48” x 48”. The OVSF skylight in different glass or acrylic glazing options meets Energy Star requirements in different Canadian climatic zones. See Energy Star for additional information. Allows for multi directional installation of skylight. Direction must be specified when ordering. See Warranty section for additional information.